"Lucinda Olive Colburn and Pamela Jeanne Gately, Westbrook College, Cla"
Westbrook College students Lucinda Olive Colburn and Pamela Jeanne Gately, Class of 1978, were in the Dental Hygiene program and lived in McDougall Hall. For their senior class candid photo, which appeared in the 1978 Tower Yearbook, they wore dark slacks with short-waisted ski jackets over sweaters and turtle neck jerseys. Both wore their hair shoulder length and parted in the middle. Lucinda's was a bit straighter while Pamela's curled under in a lose page-boy style. 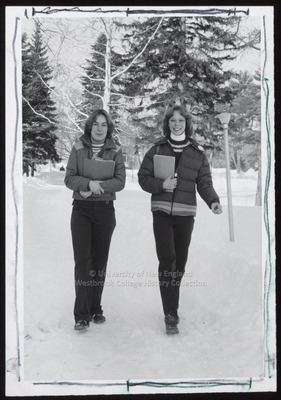 Both Lucinda and Pamela hold notebooks and walk side-by-side across the Campus Green which is covered with snow.